About 4 or 5 years ago that I wrote “How to examine your own Wing Chun?” in which I listed four elements – Principles, Posture, Position and Power (the 4P’s) to assist people to evaluate their progress in Wing Chun. Actually, I removed one element from the list, since majority of my students just started doing free Chi Sao and I thought those four elements would be sufficient for them to work with. Now, I think it would be a good time to bring back the fifth element – Precision. -Precision of Attack: When we just started to do free Chi Sao or even Gor Sao/sparring, it seems like we would be happy if we could hit our partner. But where we hit seems not that important. Actually, the more precise we are with our attack, the more efficient our attack becomes. To improve one’s skill level, the accuracy of strikes and kicks can’t be emphasized enough. Wing Chun advocates attacking the center line, since many human being’s vulnerable areas lie on this line, such as nose and chin. How accurately that we can land our strikes on the intended target on the center line? How accurately and quickly can we perform Chin Na at proper joints make our opponent difficult to escape? How accurately can we send our opponent flying to place that we want with our Po Pai or “Pulling”? As for Wing Chun weapons, Six and a Half Pole Baat Jaam Do/Eight Chopping Knife, besides being proficient in performing the form, we need to spend a lot time working with the pole dummy and knife dummy to examine and to increase our attacking precision,. -Precision of Power Released: This one is related to #4 P – Power. Specifically, on how precise that we can control our power. If one has a lot of people, yet he can’t control it very well then the power would be less effective for him. How precise can we direct our power to our opponent’s body? For example, we could use a short, impulsive power that penetrates inside opponent’s body. Or, we could use a “long energy” that send him flying. In addition, since when we practice free Chi Sao and free sparring, we usually don’t wear gloves nor protecting gears, so we need to learn to protect our training partner. If we still don’t have a good handle on the power released, then it is important that at least we learn to let go of the energy when our strike touches our partner. If one keeps hurting his or her training partners, then sooner or later no one would want to practice with him or her. Having a great ability in controlling energy released could also be a proof of higher level of Kung Fu. Postscript: In UFC 194, Conor McGregor defeated Jose Aldo to become the featherweight champion. Before the fight, McGregor already planned to slip Aldo’s heavy yet telegraphing back hand and counter with his own back hand to Aldo’s chin. Not long after the fight began, McGregor spotted the opportunity. So, he followed his plan and knocked out his opponent in 13 seconds. This became the shortest title fight in the UFC history. Before his loss to McGregor, Aldo was undefeated for 10 years. McGregor feels many people over-emphasize on power. McGregor says with a 4-ounce MMA glove it doesn’t take much power to knock out your opponent. 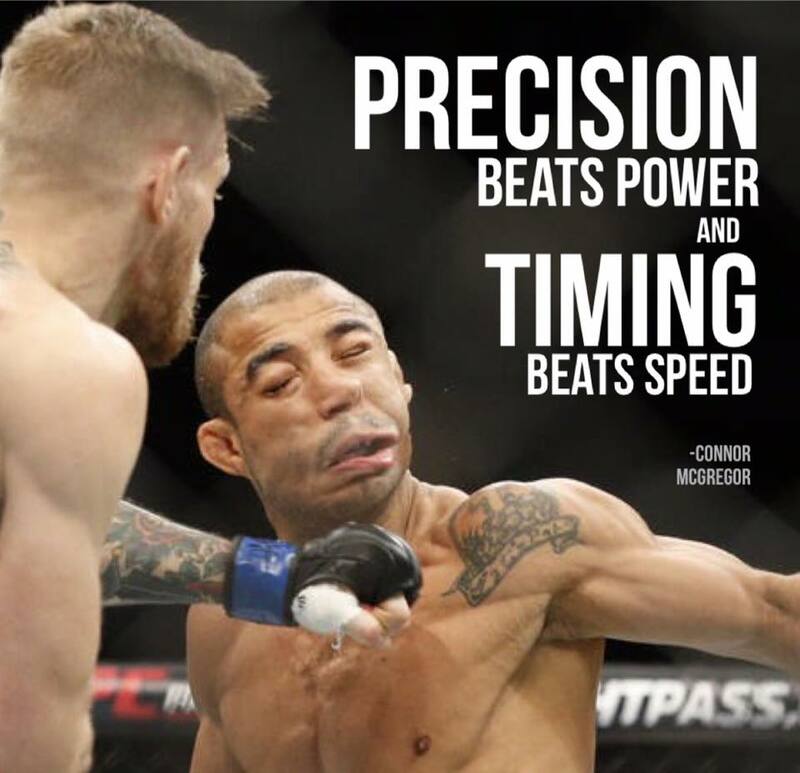 McGregor sums it up during after-fight interview by saying:” Precision beats power. 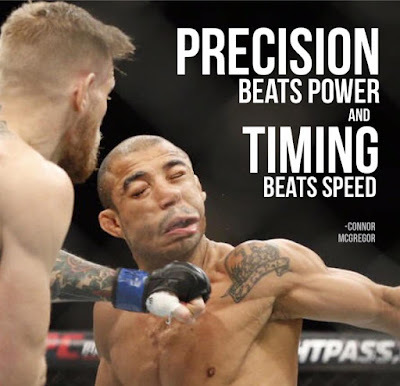 Timing beats speed.” In Wing Chun, we also have a saying – “Glass body and tofu head.” Most human body can’t take a precise shot to the vital spots, either with 4-ounce MMA gloves or empty-hand. Note: To read my previous article, “How to examine your own Wing Chun?”, please click on following link.